Three things have happened this week that have driven me to get my thoughts down on the page and hopefully this information shared will help you decide where you will spend your dollar and who you will give your vote to. Purse power, consumer consciousness and social media are real and powerful agents for change. LITTLE STORY ONE: At the post screening Q&A of the film ‘Frackman’ in Sydney this week Dayne Pratzky a.k.a Frackman the anti Coal Seem Gas activist, said that we have two powerful means of effecting change in our society RIGHT HERE AND NOW – CHANGE BANKS and CHANGE POWER COMPANIES because they are not serving us, the environment or the future well – they do not have our interests at heart. He asked us to look around the room and do a quick estimate of how much money we had invested or mortgaged to the big banks? A few million dollars suddenly invested in a more ethical provider is INSTANTLY going to make the big five sit up and think. DIRTY POWER and DIRTY POLITICS: We have a State election tomorrow and a huge debating point in the lead-up has been soaring energy prices and the lack of commitment to renewable energy targets (RET) by the major parties and the federal coalition government led by Tony Abbott – where he is actually leading us doesn’t really bear thinking about. 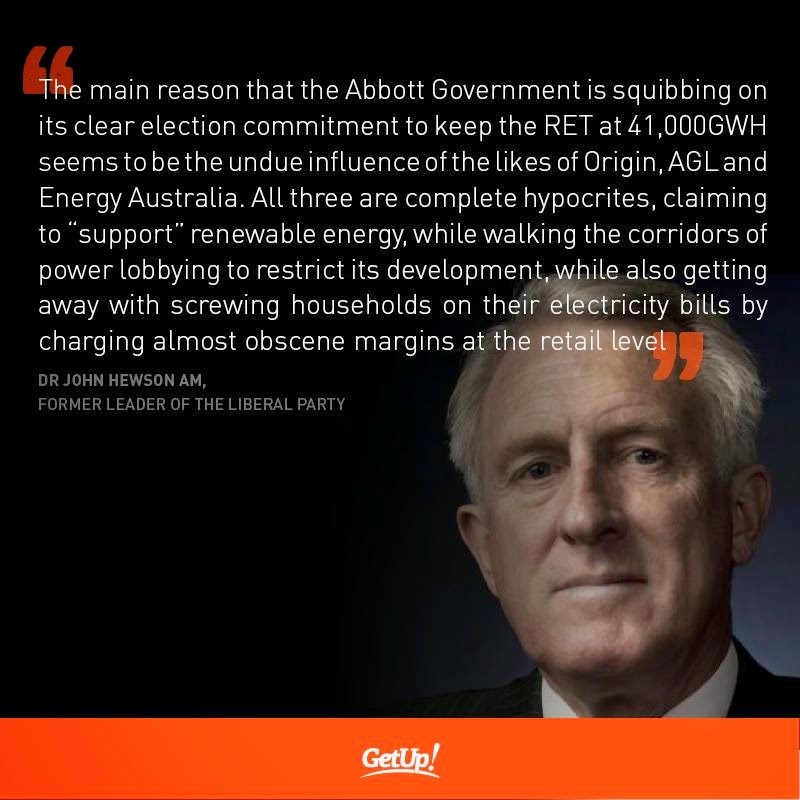 Yesterday a GetUp campaign to switch to the NZ power company Powershop was endorsed by a former leader of the Liberal Party, John Hewson – it makes for powerful and interesting reading. Maybe he too, like Malcolm Fraser, he has outgrown his party? LITTLE STORY TWO: Coincidentally I have, this week, been doing a survey of my neighbours to find out who their energy supplier was, how much they were paying and if they were interested in switching to a cheaper and greener supplier? Then I got this from GetUp and found Powershop. When I got back to our energy provider, Origin, and told them that myself and 5 neighbours were switching to Powershop because of their cheaper pricing and green credentials they immediately offered my a 30% reduction on my bill!! PURSE POWER!! – I had great delight in telling them where to stick their power poles and their company. Our recently retired and well respected Governor of NSW, Marie Bashir, also made a scathing attack on Government policy this week saying the destruction of fertile Australian farmland for mining is a “crisis” that must stop, adding: “I have never been so emphatic or political in my life”. Roundup (glyphosate) is a broad spectrum weedkiller that has made the chemical giant Monsanto extremely wealthy. For the first time glyphosate has been listed by the International Agency for Cancer Research (IARC), which is part of the WHO, as a ‘probable human carcinogen’. This was reported in the latest edition of the Lancet Oncology. A probable finding is very serious as not many things can be proven beyond doubt to cause cancer (remember tobacco?) so this is only one step down from that in terms of the IARC classifications. 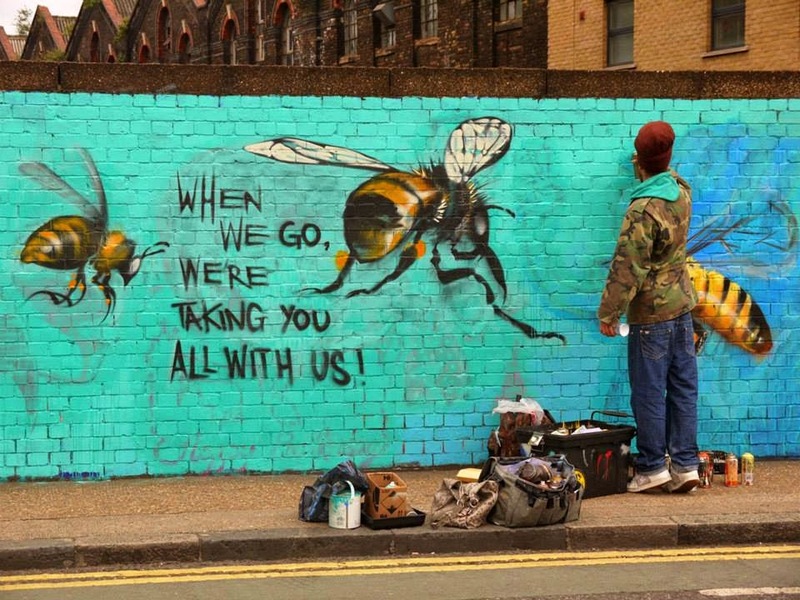 London street artist Louis Masai Michell telling it how it is. Declining bee numbers throughout the world have reached crisis point. As you would expect there will be much that Monsanto has to say about this but, if past revelations are anything to go by, their favourite tactic is to shoot the messenger and destroy their reputations. IARC is the independent, scientific authority on cancer classifications. Genetically modified corn was engineered (by Monsanto) to withstand the weedkiller glyphosate. This enabled farmers to blanket spray their crops – the weeds would die and the crops survive. I remember a question from a member of the audience “How can eating food that has been sprayed with weed killer be good for you” – common sense tells you that it’s not, it’s just makes it cheaper and feeds the obese giant that is the industrial food industry. Here is just one example how this radical and thoughtless destruction breaks the chain in the delicate cycle of life. Increased use of GM crops and agricultural chemicals has almost totally wiped out the monarch butterfly, that was once a common sight in many parts or rural USA. 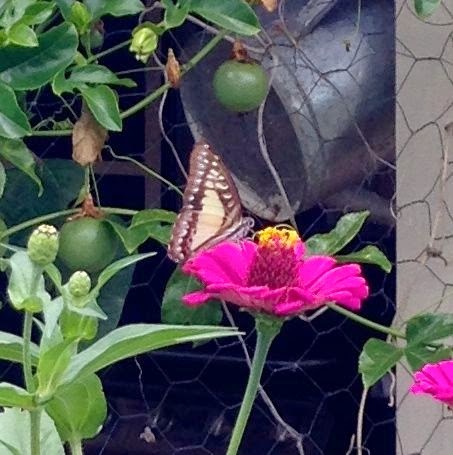 They feed on flowering crops and are pollinated by a weed that was being killed chemical spraying. – and now we have proof that it was killing us too. LITTLE STORY FOUR: I had a young family friend, her husband and baby visit the other day and she was proudly telling me about the raised veggie bed they had put in and that they had covered it in mesh ‘to keep the bugs out’. When I asked them how anything would get pollinated and how she would actually get any vegetables – beans, eggplant, zucchini, a look of total amazement passed between them. In all my years of teaching gardening classes I’m constantly stunned by how much we DON’T KNOW about the world around us – educated people – about the fundamentally important things that make this beautiful planet of ours tick. VOTE GREEN, SWITCH POWER COMPANIES, CHANGE BANKS, DON’T SPRAY and PLANT A GARDEN. That’s not much of shopping list for the week?